Typically when I sit down to do a This Day in Gaming History post, it presents nothing more than a nice little reminder of a game I kinda sorta remember playing back in the day. You know the day. Back when my hair was thicker, my waist was smaller and I didn't have to worry about how my knee was going to feel when I got up from typing 200 words or so. That makes a day like today a little nicer. You see, back in 1993, a game called Star Wars: X-Wing was released on the PC. While I believe I still own a bootleg copy of the game on CD - given to me, along with Star Wars: Dark Forces, by a relative who shall remain nameless - I knew instantly that I was not the one who could summarize this game and do it justice. For that, I turned to the creator of Game-Block.com and my frequent Heads Up podcast cohost, Ryan Hamner. As anybody who has listened to Heads Up or the Johnny Goodtimes Fun Factory podcasts will know, Ryan and I both love us some Star Wars. But Star Wars: X-Wing is the game that Ryan feels most passionate about in terms of George Lucas's saga. X-Wing remains my favorite Star Wars game to this day. It took two of my favorite things, Star Wars and flight simulator games, and mashed them together, striking a perfect balance between accessibility and realism. LucasArts did a wonderful job of putting the sights and sounds of Star Wars in the hands of gamers, the laser blasts and engines sound just like they do in the movies and the detailed cockpit was not only true to the films, it took the place of a traditional gaming HUD which deepened the immersion. The timing of the game couldn’t have been better, Super Star Wars had just released on Super Nintendo a year earlier so Star Wars games were becoming popular again. X-Wing delivered a completely different experience from the side-scrolling action game, it offered gamers the chance to sit in an X-Wing for the first time at home and delivered gameplay that was better than anything to be found in an arcade. It used its many game modes to explore parts of the galaxy that we hadn’t seen before, and filled in some of the story gaps that the movies didn’t have time to cover. 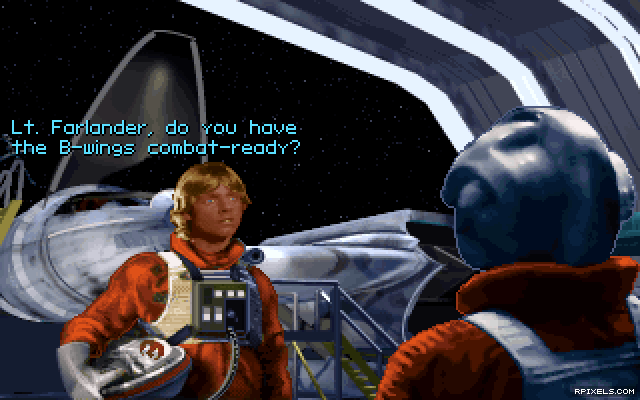 LucasArts did a great job supporting the software as well, releasing a pair of expansion packs that added new storylines as well as the opportunity to fly a B-Wing for the first time. I still play X-Wing and its follow-up TIE Fighter to this day, a testament to the quality of both games. Many space combat simulators have come along since 1993, but none have ever captured the unique magic that the original X-Wing has. It’s a one-of-a-kind game that doesn’t require you to be a Star Wars fan or flight simulator junkie to appreciate. Couldn't have said it better myself. Be sure to check out Ryan's page, Game-Block.com, to read up on X-Wing and many other games and topics centered around Star Wars, video games, comic books and more.